Ian Evans began his club career with Pontypridd before joining the Ospreys in 2005. 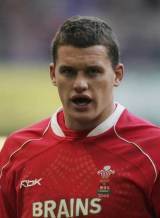 Evans won a Grand Slam with Wales Under-21 in 2005 beofre making a try-scoring debut for the full national side against Argentina in 2006. He was called up to the Wales squad for the autumn internationals in November 2006, playing against Australia, Canada and New Zealand. A shoulder injury sustained while on regional duty with the Ospreys ruled Evans out for the second half of the 2006-07 season, and upon his return to fitness in June he was named in Gareth Jenkins' preliminary squad for the 2007 World Cup. He made the cut and made two appearances during the tournament, against Japan and Fiji. He was retained in the Welsh squad by new boss Warren Gatland for the 2008 Six Nations, making four appearances as Wales secured the Grand Slam. Evans sustained cruciate ligament damage against the All Blacks later that year, ending his season, and he was doubly unlucky after picking up a serious chest injury on his return to playing with Swansea. He re-emerged as a regular with the Ospreys in 2010-11 and was rewarded with a first Wales cap in three years against Australia in December 2011, before a call-up for their Six Nations opener against Ireland. Evans kept his place in the squad for the next four matches and established himself as an integral part of the Grand Slam-winning side. Injuries limited to him just a further three appearances for Wales in 2012 but he started all of their 2013 Six Nations games as Wales retained the championship and he was rewarded with a place on the British & Irish Lions' tour to Australia.